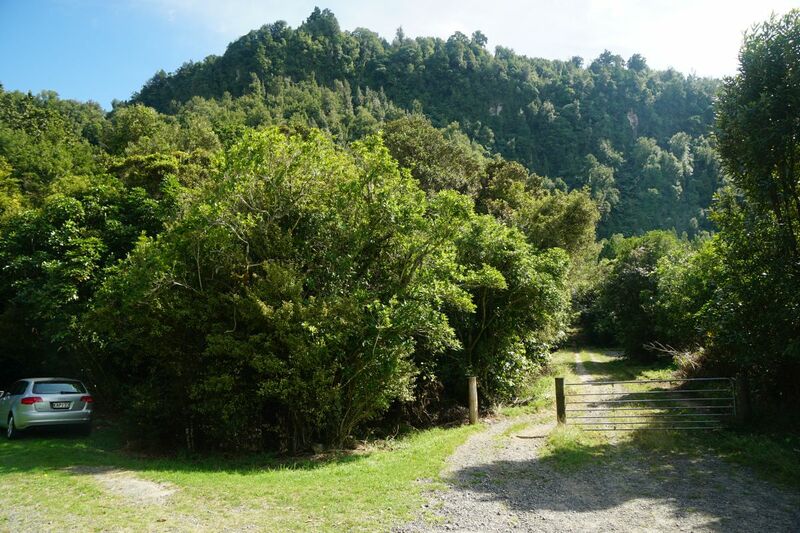 The western (Lake Rotoiti) end of the track is accessed from the northern end of Tamatea Street, off SH30, where there is a parking area and toilets. 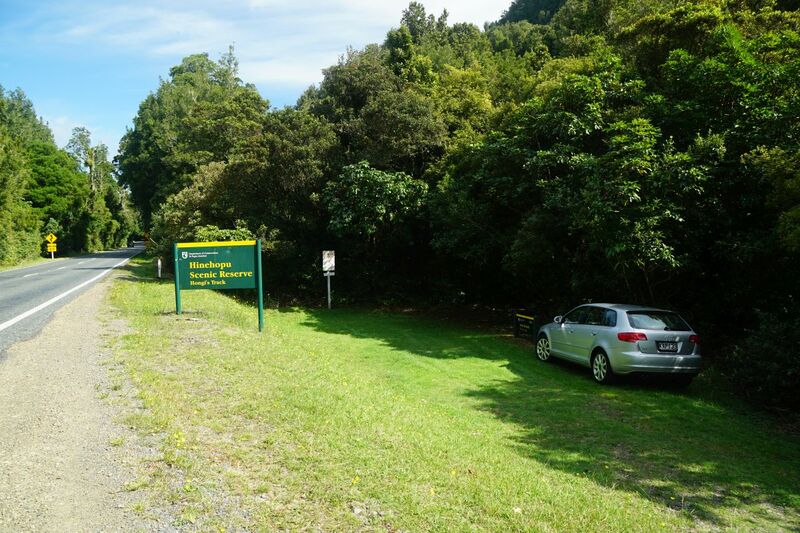 The eastern (Lake Rotoehu) end is accessed directly from SH30, where there is a small parking area with no other facilities. 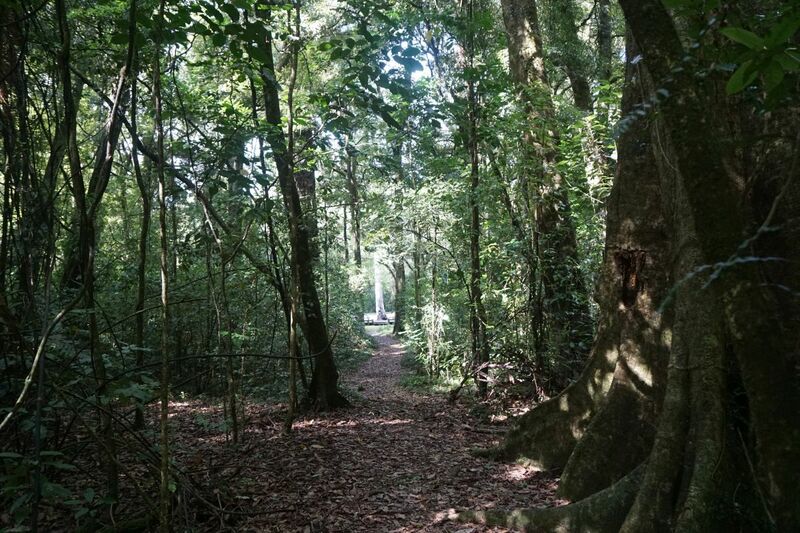 The track is an easy walk, with no steep sections and no steps, except for occasional tree roots and fallen trees that may have to be stepped over. It runs alongside the base of a steep rock face between the two lakes, and more or less parallel to SH30. 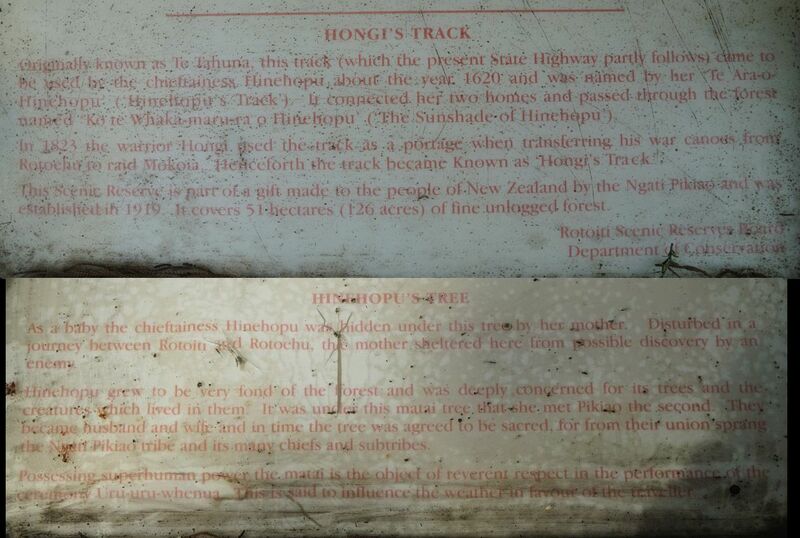 The track is about 2.7 km long, or 2.9 km including the short side track to Hinehopu’s Tree. It is well marked with orange DoC triangles showing the way, as well as being well formed and regularly used. Information about the track can be found on the DoC web site. At the Lake Rotoehu end there is no marked track for access to the lake, but there is a quad bike track starting at the parking area which can be used to access the lake. This track continues for several kilometres through forest area, but views across the lake can be found just a short distance down the track, and along a short but uneven side track. 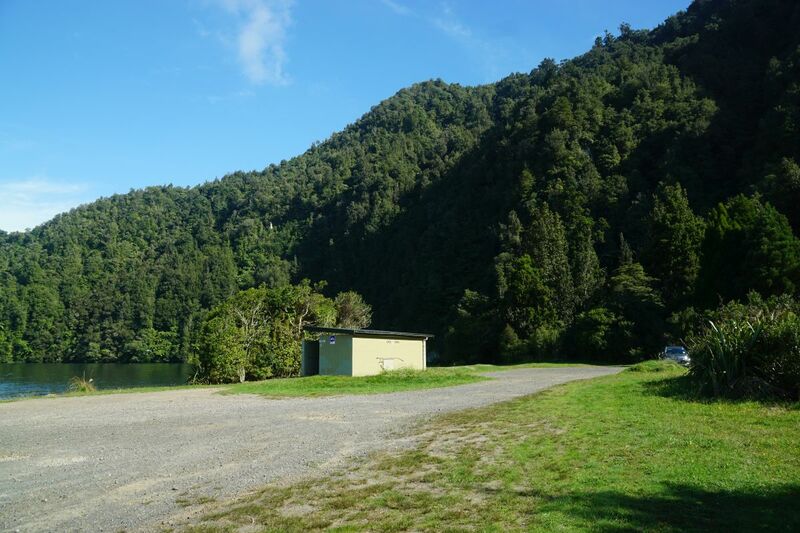 The parking area and toilets at Korokitewao Bay on Tamatea St at the eastern end of Lake Rotoiti. The track starts on the right, behind the parked vehicle. The start of the track is not marked at the parking area, but is at picture centre, with 3 rocks across it to prevent vehicle access. Track signage is located a short distance from the track start, but gives no indication of track length or walking time. 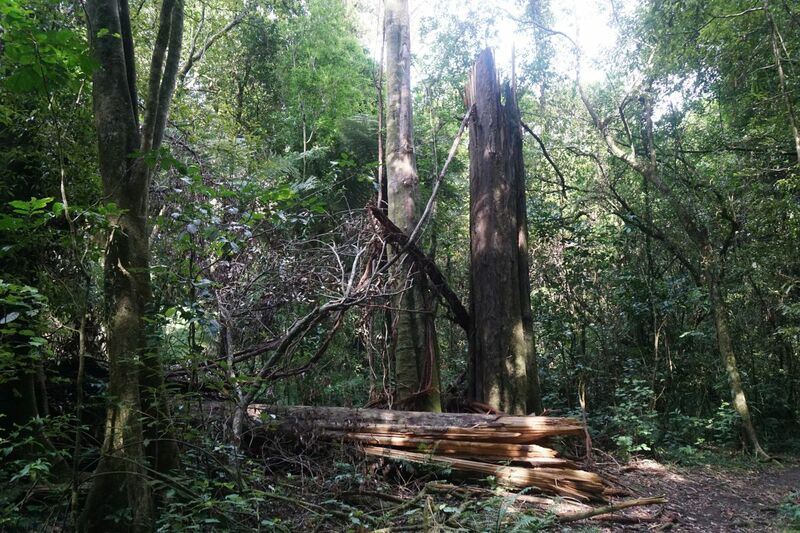 The track runs through mature, unlogged forest. 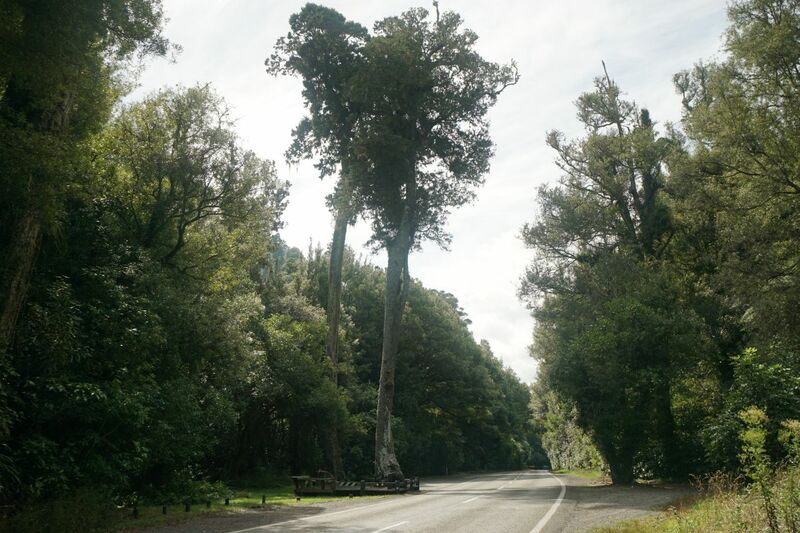 Here a large Pukatea on the right. 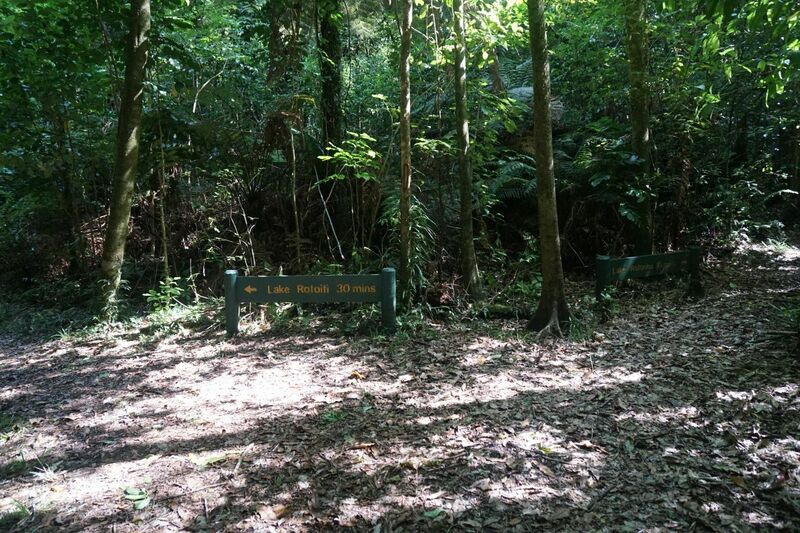 The 51 hectare scenic reserve was gifted to the people of New Zealand by Ngati Pikiao in 1919. 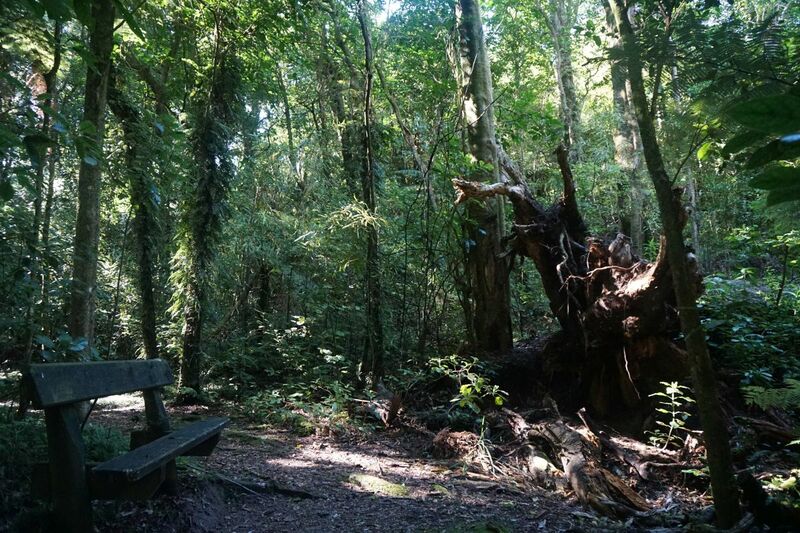 A bench seat has been provided about halfway along the track, with a view to the roots of a large, fallen tree. There are numerous fallen trees alongside or lying across the track. Most of the ones lying across the track have had a section removed, so no climbing across tree trunks is required. This one has snapped off a few metres above ground level, falling straight down alongside the track. 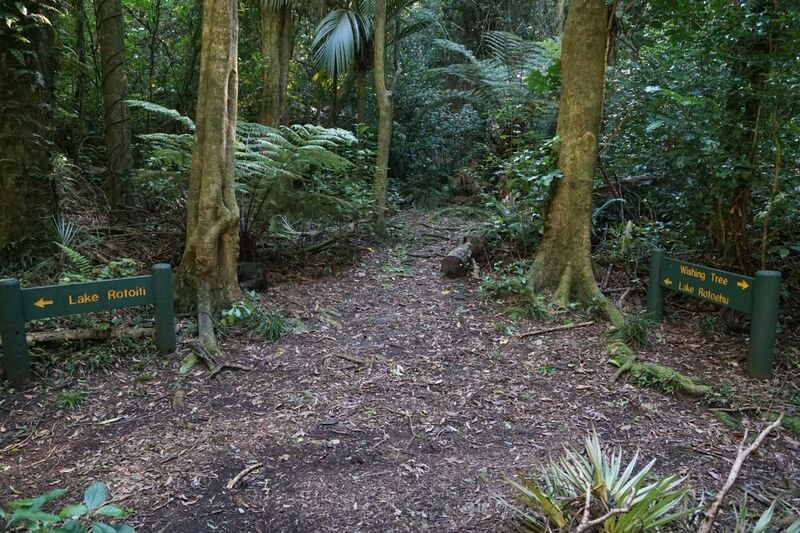 The side track to Hinehopu’s Tree, a short loop out to SH30, is well marked. On this sign (far right) the tree is called the Wishing Tree. The other end of the loop track is also well marked. 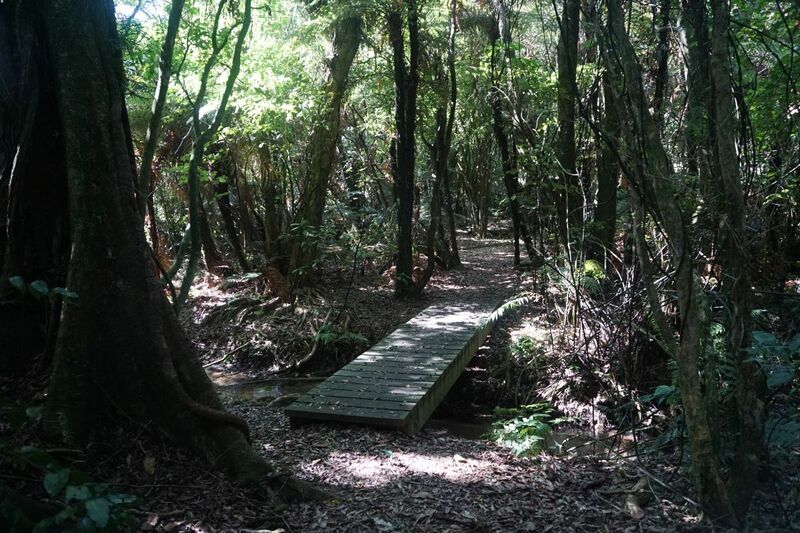 A small bridge near the Lake Rotoehu and of the track crosses over a small stream, next to another large Pukatea tree. 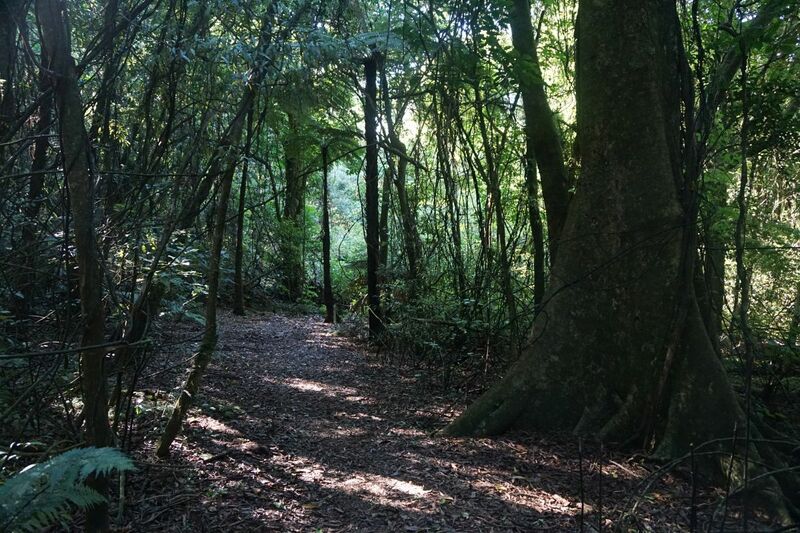 There are also numerous mature Rimu and other native trees alongside the track. 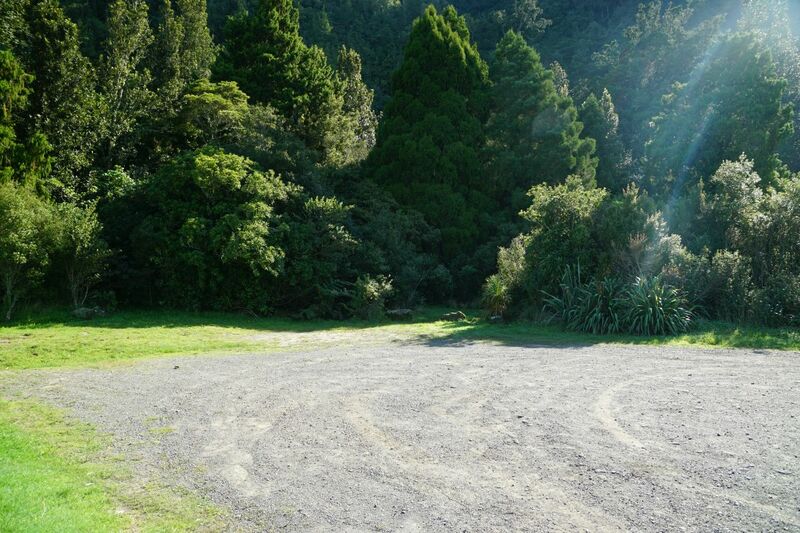 The parking area alongside SH30 at the Lake Rotoehu end of the track. The track starts on the right, by the sign at the far end of the parked vehicle. The entry through the open gate to the quad bike track leading from the parking area. The closed gate is locked. There is no signage near the track. About 50 metres down this track a short (about 160 metres) track covered with coarse scoria leads down to the lake edge. 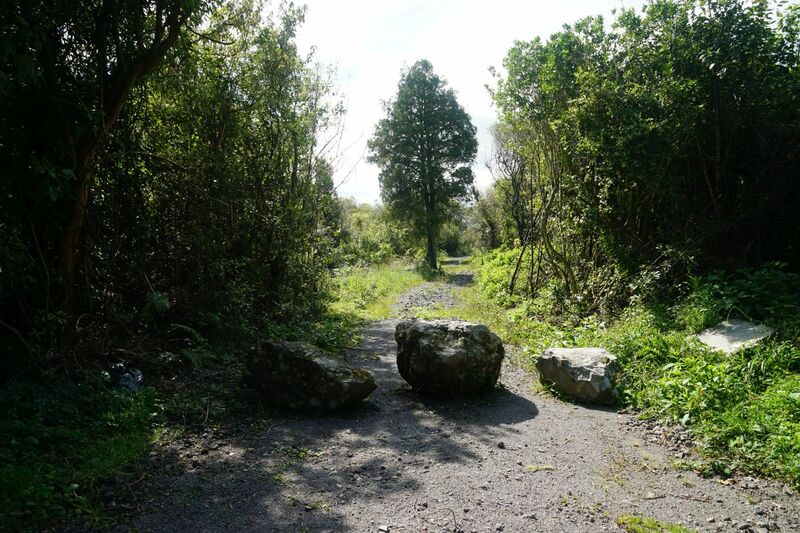 Rocks have been placed across to prevent vehicle access. View from the lake edge at the end of the short side track, across to the steep rock faces alongside the quad bike track, a continuation of those alongside Hihehopu/Hongi’s Track. 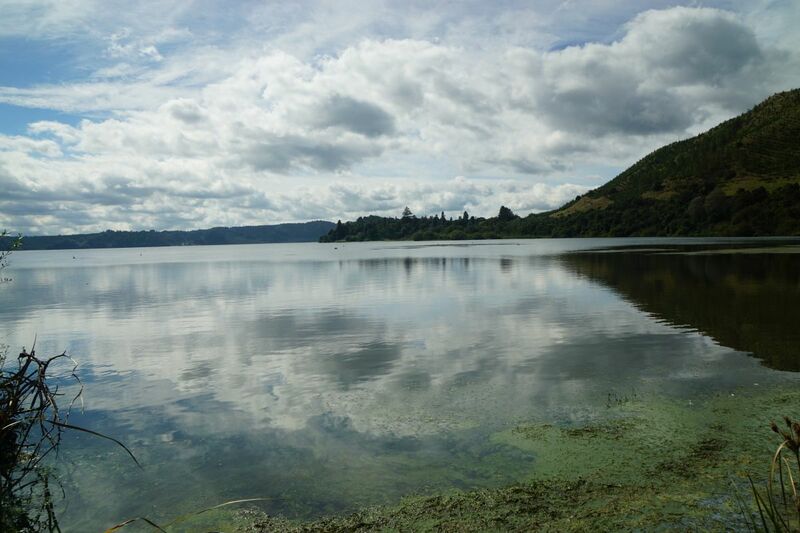 And a view along Lake Rotoehu, with SH30 at the base of the hills to the right. 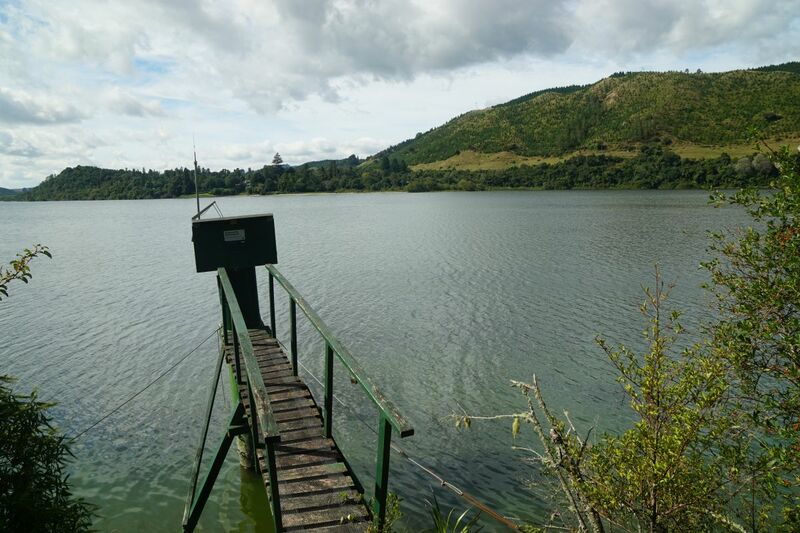 Continuing along the quad bike track for about 600 metres also gives views across Lake Rotoehu, by a small jetty containing environmental monitoring equipment. SH30 runs along the foot of the hills on the far side of the lake. From here the track continues uphill through forest area. 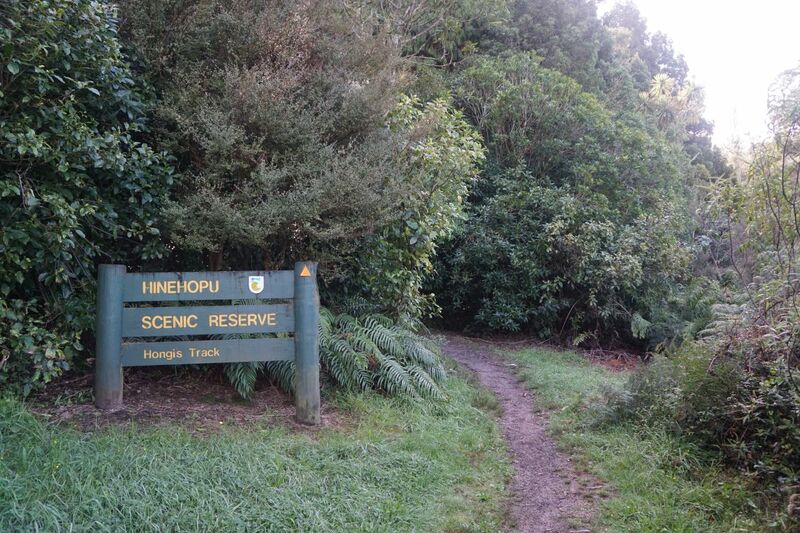 The short loop and side track to Hinehopu’s Tree was taken on the return walk from Lake Rotoehu to Lake Rotoiti. From the loop a short side track leads to SH30 and Hihehopu’s Tree. The tracks at the fork are well marked. A straight track, about 50 metres long, leads to the wishing tree and SH30. Hinehopu’s Tree is visible in the sunlight at the far end of the track. A platform with information panels surrounds the tree. The panels can be difficult to read. 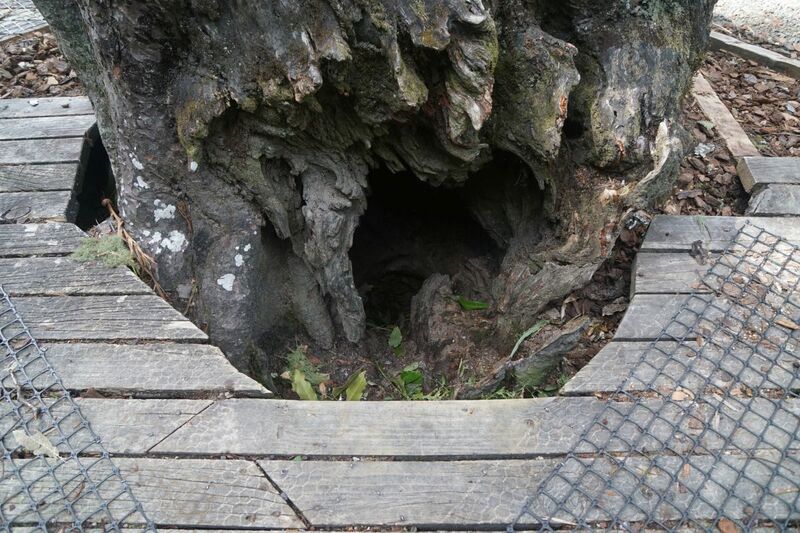 The base of the Matai, Hihehopu’s Tree, with a hole in the root. Hinehopu’s Tree seen from the opposite side of SH30. There are parking areas by the side of the road, on both sides of the tree. The GPS tracklog shows the tracks walked, and places of interest along the track. 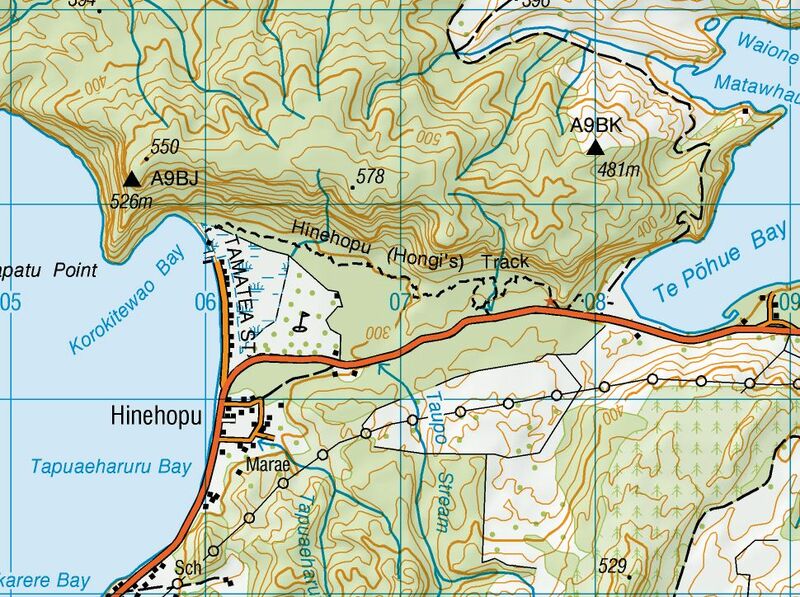 The tracks on the far right, by Lake Rotoehu, are not part of Hinehopu/Hongi’s Track, but can be used to get views of the lake. Lake Rotoiti carpark to Lake Rotoehu carpark: 2.7 km, 43 minutes. 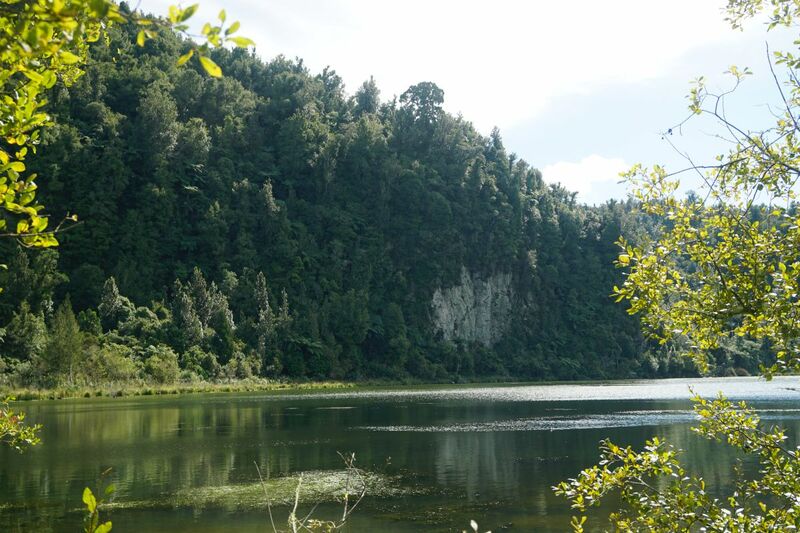 Lake Rotoehu carpark to Lake Rotoiti, including Hihehopu’s Tree: 2.9 km, 48 minutes. 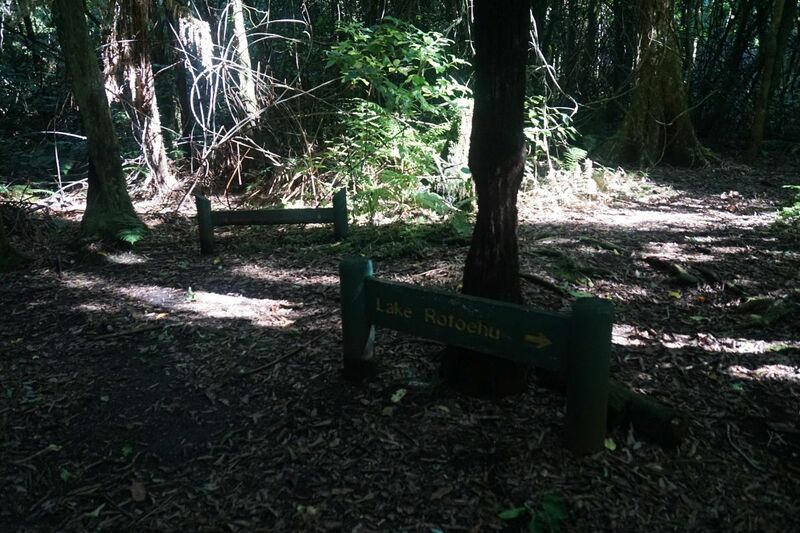 Access tracks to Lake Rotoehu: 1.8 km, 25 minutes. The topographic map excerpt covers a slightly larger area. The escarpment to the north of the track and continuing alongside the lakes can clearly be seen as very close contour lines. The aerial image, from Google Maps, also shows the tree cover along the length of the track. The tracks were walked on March 18, 2017.